With the Gulf of Maine in our rearview mirror, my wife (Kitri), our Australian Shepherd (Laynie) and I leave the seacoast, giving into the strong gravitational pull that routinely brings us back to the headwaters of clear, cold streams and weather-beaten peaks. My familial tripod answers these mountain calls as a necessity. 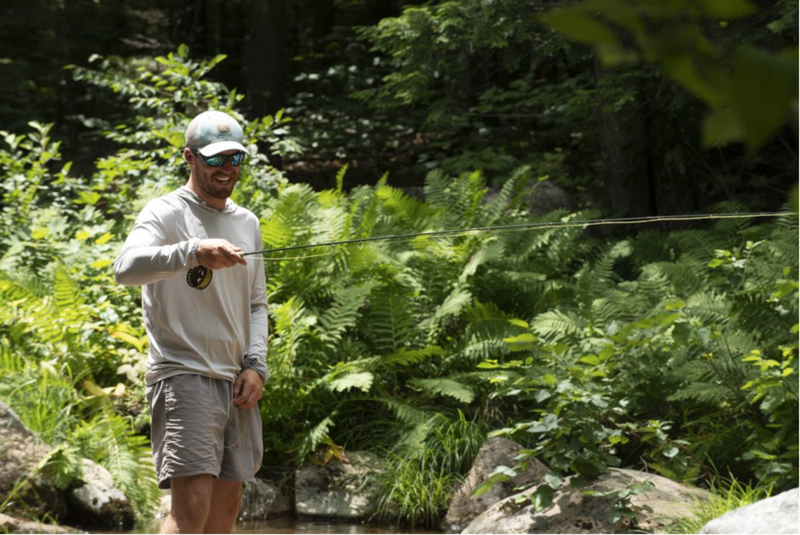 There’s something very different about the energy in the mountains, especially when contrasted by summers spent guiding clients to striped bass on the rocky coast and flats of Southern Maine. 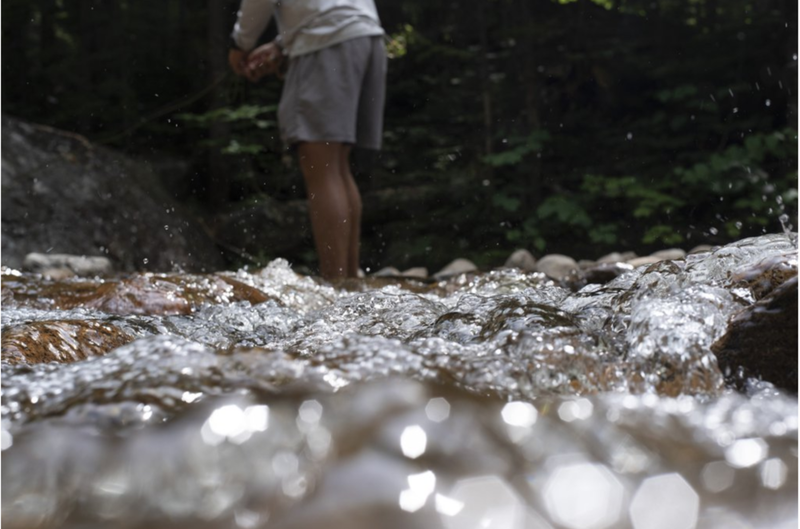 The mountains offer a reprieve and create time to explore fish habitats at the very top of our interconnected water system, where rivers are born. This pursuit is a welcome change from fishing a starkly different part of the system, where fresh water meets its demise and mixes with salt at sea level. 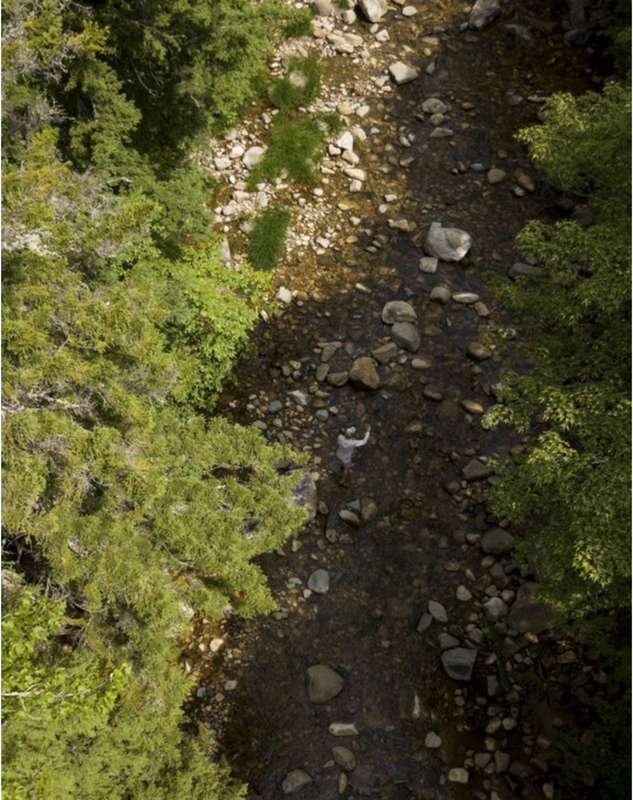 As we traverse towards green, lush national forest nestled into the White Mountains of New Hampshire, the view changes, and water cuts through the landscape. The coastal rivers are wide and deep, draining thousands of upstream acres, ultimately becoming one with the ocean. The further we drive the smaller and more frequent our river crossings become. Brooks pour out of the mountainsides, cutting deeper ever so slowly into the terrain, washing over smooth beds of cobble, creating endless riffles, runs, and pools. The road turns to dirt and national forest signs appear. The gradient steepens, winding tighter and tighter. An overgrown pull off appears just big enough for two cars. We’re met by photographer, Joe Klementovich who hops out of his rig with a smile. We’re playing in his “backyard” today and morale is high. Laynie barrels out of my 4Runner, hits the dirt road with all 4 paws, and heads to the woods. She knows this program. Laynie, 12 years old now, spent the first half of her life wading western rivers, looking for mice while I searched for trout. Her fine tuned ears have become keen to the sound of a trout set. Laynie can’t resist the opportunity to greet every character we meet along the way. We rig up as Joe reminds us of the effects of hurricane Irene, along with some recent low water events. These mountain rivers boom and bust, overflowing their well defined banks during high water and trickle warm and low when the earth begs for rain. Amidst these dramatic cycles are outlier data points that are becoming more and more common as weather events intensify and climate changes. Born in this delicate yet ferocious mountain headwater is a small, resilient trout. Evolved over thousands and thousands of years the Eastern Brook Trout is perfectly adapted to endure the cycles of these tumultuous rivers. Outliers of high and low water have become more frequent which a combination of Mother Nature and human impact are to thank. Nonetheless, the brook trout’s spirit is put to the test. As we carefully wade upstream I’m reminding myself that today’s quarry is measured in ounces, casts won’t be over 25 feet long and we won’t have a steady afternoon breeze in the face. The contrast of fishing small water after a season spent chasing and guiding clients to strong, coastal striped bass is profound. Although small, these brookies are ravenous, attacking anything that resembles food as soon as it hits the water. Brook trout have a strong spirit to survive and will move to well oxygenated, colder water in the heat of the summer. They feed on bugs that resemble miniature dinosaurs when peered at more closely under a microscope. Just because the scale is small on these streams do not overlook the wonder of these incredible ecosystems filled with a highly developed group of bugs, fish, mammals, microorganisms and birds. You may just have to pause a little longer to soak in all the wonders. Without water the terrain would look starkly different. Water is the chisel that has carved these rocks, and cut brooks, creeks, streams, and rivers into the landscape. Where clean water flows, life flourishes. Water connects these NH highlands to coastal Maine. Our footprints through the stream are felt long after we go, even though they may be more faint than science could ever detect. As the water flows past Kitri, Laynie, Joe and I it doesn’t stop or even slow for us. It continues it’s descent to the sea; linking mountains, meadows, plains, canyons and coast. As we continue to hike up the drainage I wonder when, if ever, I will fish this water again. I’m not wondering when I’ll be back to this stream or standing on this particular piece of granite, I’m wondering when I will be surrounded by these same water droplets again. Will I be on my skiff poling a mud flat weeks later? Or will this same mountain water fall from the Bahamian sky this winter as I welcome rainfall on a hot day at Bair’s Lodge? Maybe I’ll never meet that water again yet I am drawn to how it connects us all. Water’s our common bond and we share it with 7.5 billion other human inhabitants of this planet. 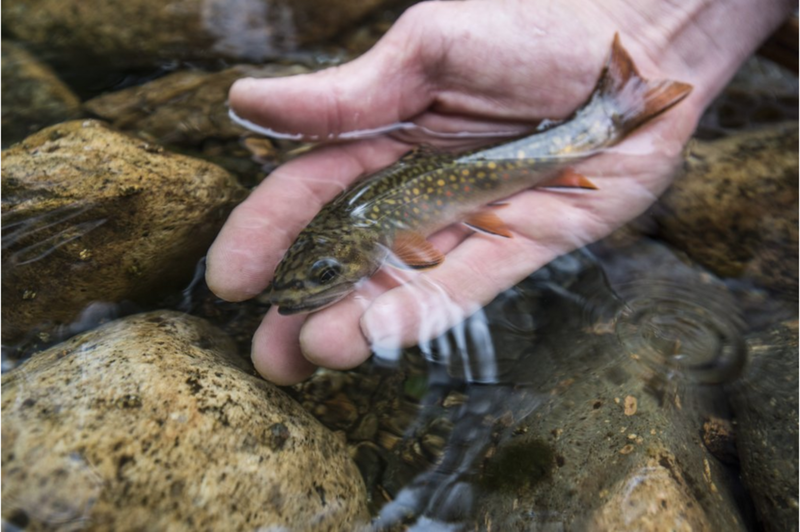 The same water that holds tiny mountain brook trout in NH may fall as snow in the Himalayas years later, or be used to tan cowhide in Italy, or grow grapes in California, or even water a lawn in Utah. Water’s ubiquitous nature makes it one of our most important resources that we share as members in the worldwide community. We are all brief caretakers of the resource; whether we’re replenishing our own source within, cooking with it, or fishing it, we can’t live without clean water. Understanding our place in the system can be profound and draws our perspective to the global community, making our world a smaller place with much more in common than may seem. Whatever we leave behind on our planet, water will chip away, erode, and wash downstream on its journey to the sea and back to the atmosphere. Author Bio: Kyle Schaefer is a T&T pro-staffer based in Kittery, Maine. By summer, Kyle guides clients to striped bass on the fly. By winter, Kyle’s found managing Bair’s Lodge in South Andros, Bahamas. He regularly writes for the Marine Fish Conservation Network and other publications with a focus on conservation & fisheries issues. Photography By: Joe Klementovich of Joe Klementovich Photography . 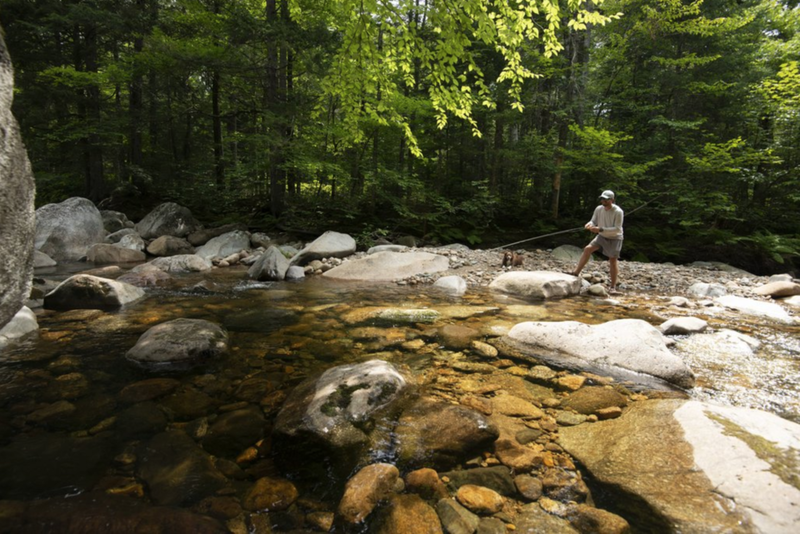 Joe is an outdoor photographer living in North Conway, NH. 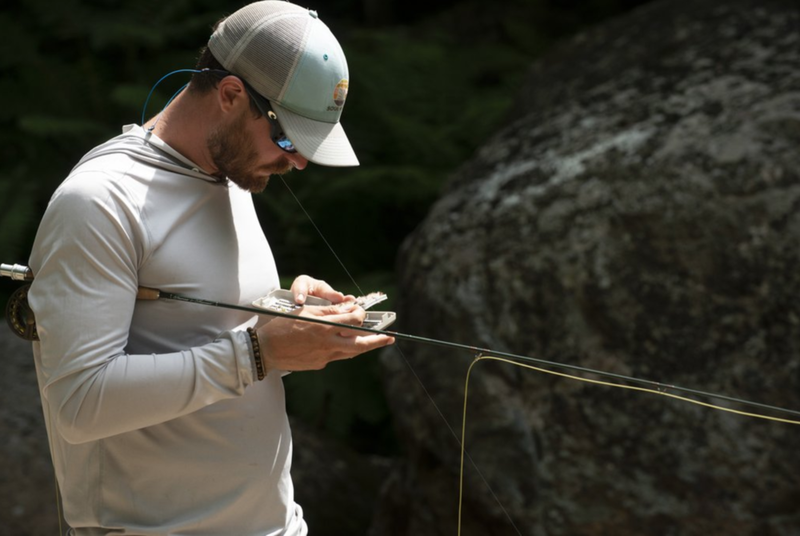 Joe's passion for storytelling through imagery has brought him to some beautiful places and given him the opportunity to pursue his favorite hobbies including fly fishing and climbing. Learn more about Joe, his photography and how he can help you document your next expedition at his websitewww.klementovichphoto.com.